Today’s plan was to eat well, do my resistance training after teaching 3 sewing classes this morning, and finish the day with a nice dinner out with the Hubsy. Well, that’s not exactly how things went. My day started with my tire pressure indicator light on. No problem, I’ll stop by the dealership on my way to class. I got to the dealership and asked them to please check the tire as this was the third time in a year that the light has gone off. I get there, and the lady at the counter tells me that they are not authorized to work on my car. Um, when I bought my (used) car at this dealership I was assured that they would be able to perform the required maintenance. I also bought the wheel and tire insurance when I financed my car. The lady at the counter promised me that she would look into it (still haven’t heard from her 8 hours later) but in the meantime they would check the tire pressure. Onward! I had a little more time before class, so I stopped for a green tea and a snack at Starbucks. I had already eaten breakfast, so this would serve as my mid-morning snack. Sadly, it was gross, so snack skipped. I had three students right in a row, and I was pretty spent after that! Luckily the mom of my students is an amazing baker and her kids are very thoughtful. 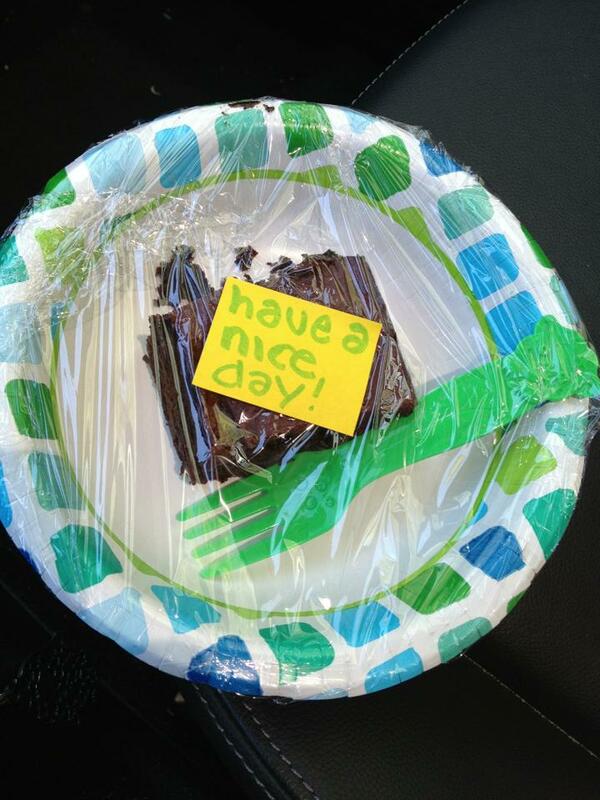 They sent me home with a surprisingly delicious chocolate zucchini cake, complete with a sweet note! I’m sure it wasn’t the healthiest of lunches, but at least it was food! When I got home, I added some cheese and crackers to the meal for a “better-rounded” lunch. I had planned on going right into Zumba and then RT, but I had a phone appointment at 1pm regarding a job I interviewed for on Wednesday, so that would have to wait. My appointment was late, but it was good news (nothing official yet, but it looks as if I have a new job!) so that was OK.
By the time I was done with the phone call, I was an hour deep into the season finale of Hell’s Kitchen, so RT would have to wait. When I was finally able to get off the couch, I remembered that I needed to change the handle on the toilet, so it was off to the tool box. It took some doing, but I finally got the handle changed only to have the toilet completely overflow from the bathroom through the kitchen to the living room. YIKES!!!! Out came the towels to try and get the worst of the mess, then it came time to assess the damage. We store things under our bar style kitchen table, so I had to pull everything out (including my husband’s amps and other music gear) to get to the puddle that was under the wine rack. I finally got all of the water soaked up, and luckily the toilet is working just fine now. I’m still not sure exactly what happened, but at least it is not happening anymore. After all of that, I decided that I had done enough physical activity for the day and RT was just going to have to wait until Sunday. I am taking the bus to dinner tonight, and the station is about a half mile away from my house, so I will get some exercise in today. It was not a great day for eating or for exercise, but in life sh*t happens.